19. Lightsaber Salt and Pepper Shakers. Good vs. evil, Empire vs. rebels, salt vs. pepper—now you can determine who wins! 18. Death Star Kitchen Timer. When your food is ready, it lights up, but it doesn’t blow up. Such a helpful little guy! You can change the dial to make your toast light…or dark. In significantly less time than it takes to train to become a Jedi master, you can get a nice soup going. Don’t fight at the dinner table, though. So that’s what was inside that little droid all along: beer! You can’t steal these like they did in Rogue One. You have to pay for them and stuff. 11. Darth Vader Kitchen Apron. 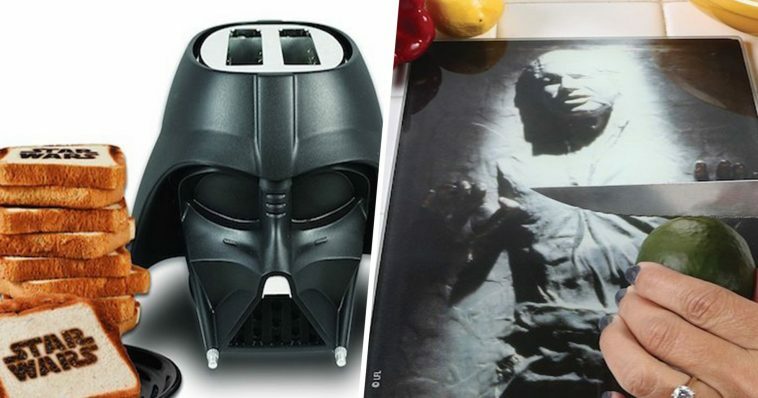 You’ll look just like Darth Vader looked like when he was baking a pecan pie.